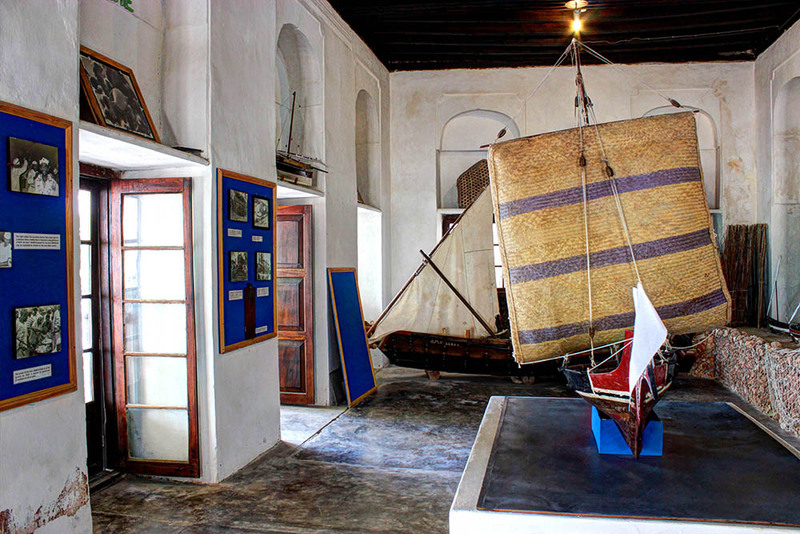 I made the most of my time in Lamu and tried to visit all the cultural and historical sites on and around the island including Lamu Museum. 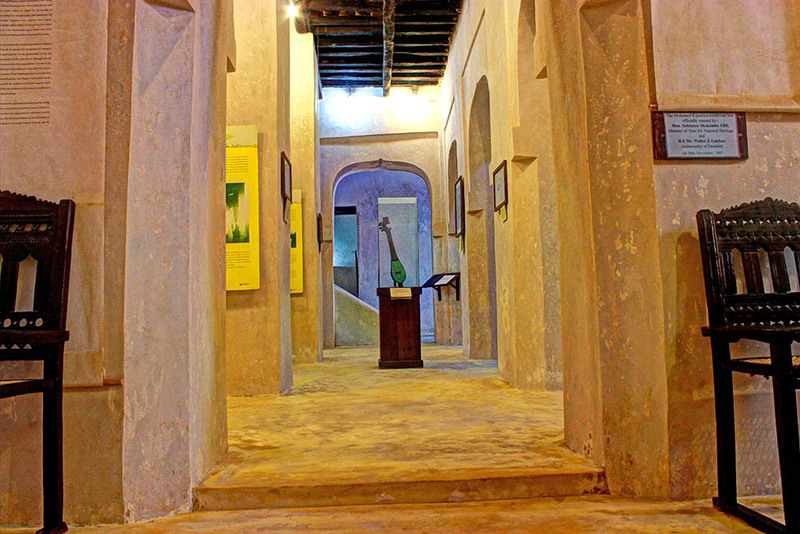 Lamu museum is located in a grand Swahili warehouse by the seafront not far from the old jetty. 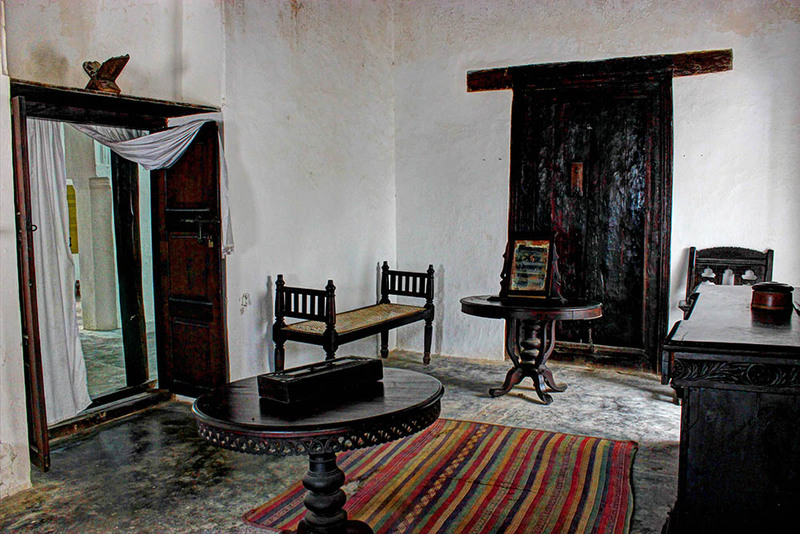 Most of the ground floor is dedicated to the works of Muhammadi Kijuma. 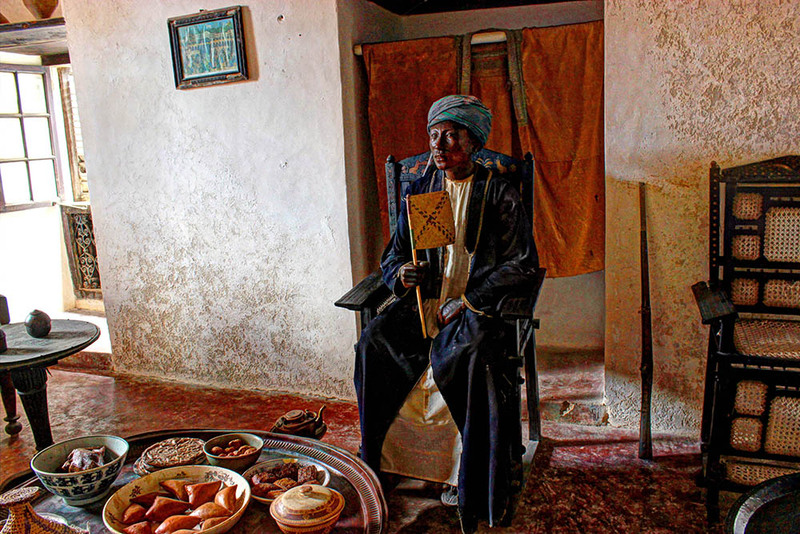 Muhammad bin Abubakr bin Omar Bakarii (commonly called Muhamadi Kijuma) was an outstanding man with many talents. 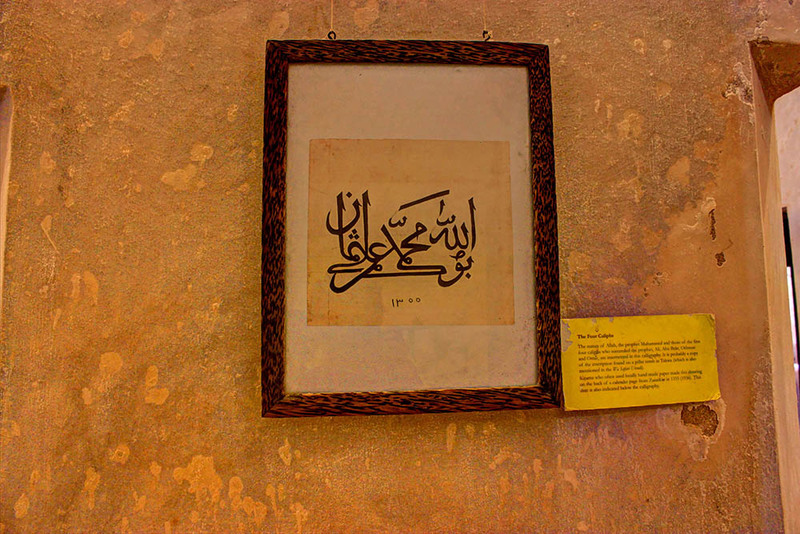 As a scribe, calligrapher, poet, musician, dancer and wood-carver, he left traces in many fields. 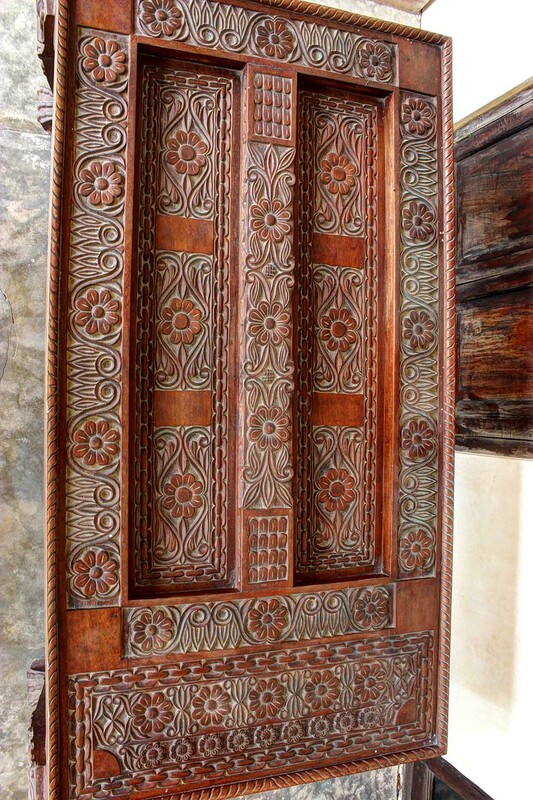 After having received only a rudimentary formal training, he took up the traditional craft of carving doors. 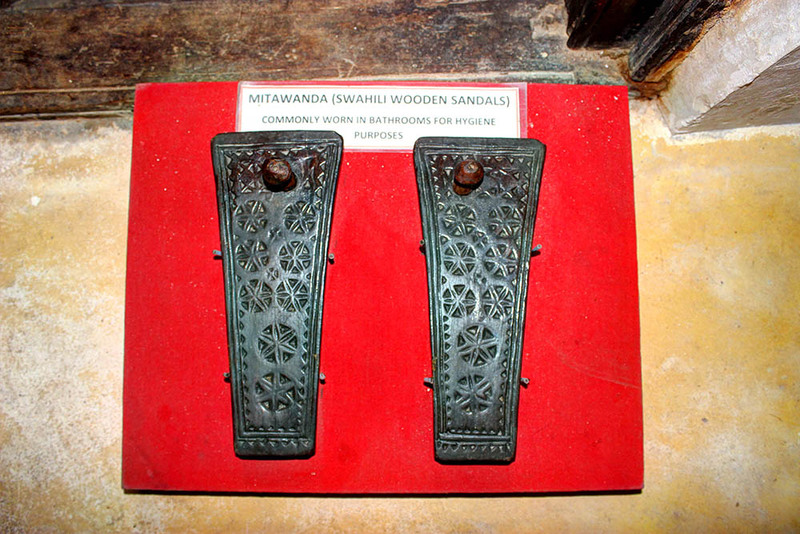 Some of the doors carved by him can still be found in Lamu, like the door of the Lamu Museum. 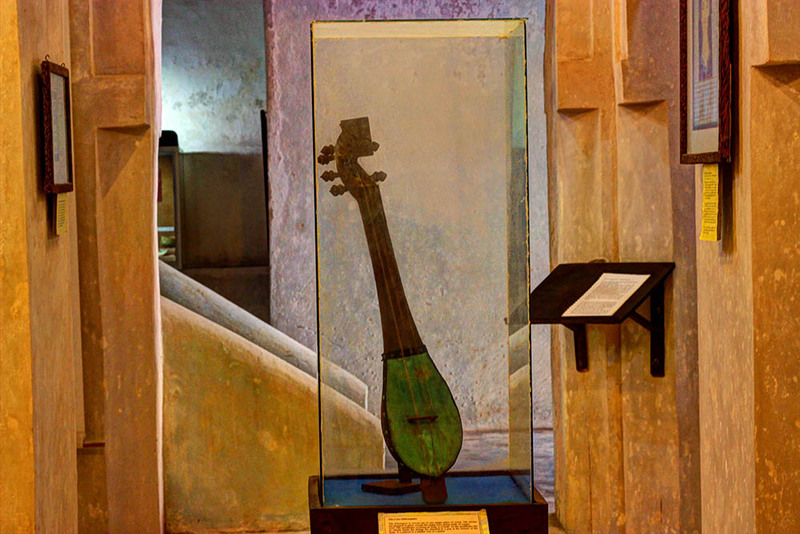 The lute (kibangala) carved by Kijuma and was given to his friend Ernst Dammann ( a linguist) as a present. 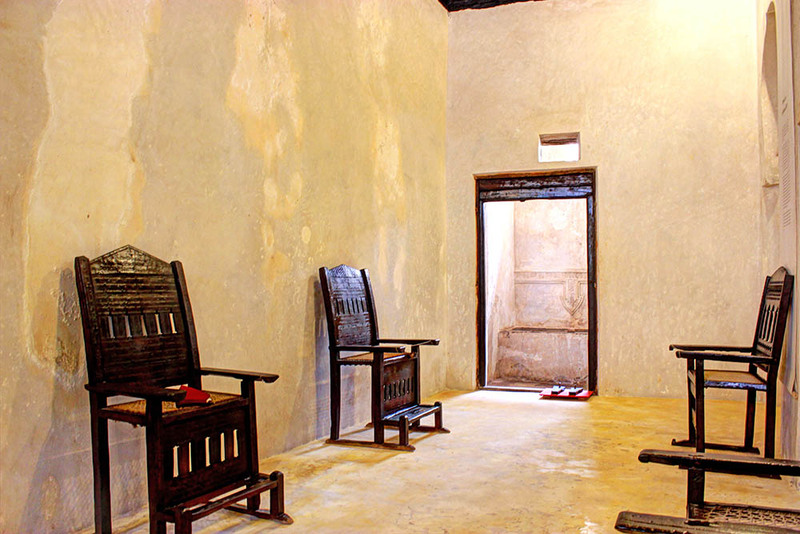 In addition to the exhibition, there is some Swahili style furniture and a bathroom. 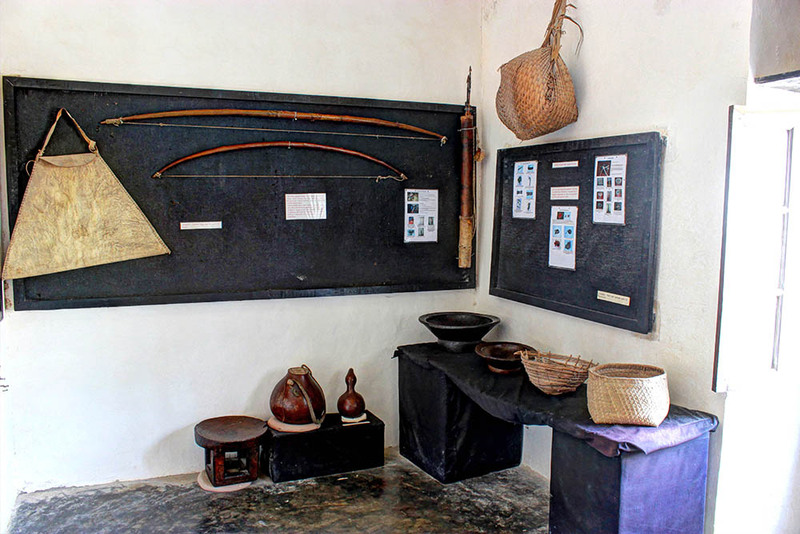 There is also a room dedicated to displaying items excavated from various historical sites along the coast of Kenya. 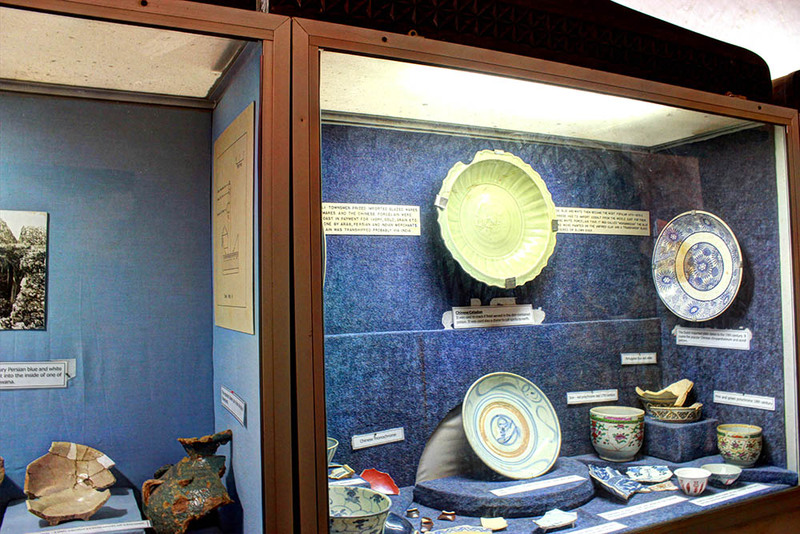 Majority of the artefacts are excavated Chinese porcelain. 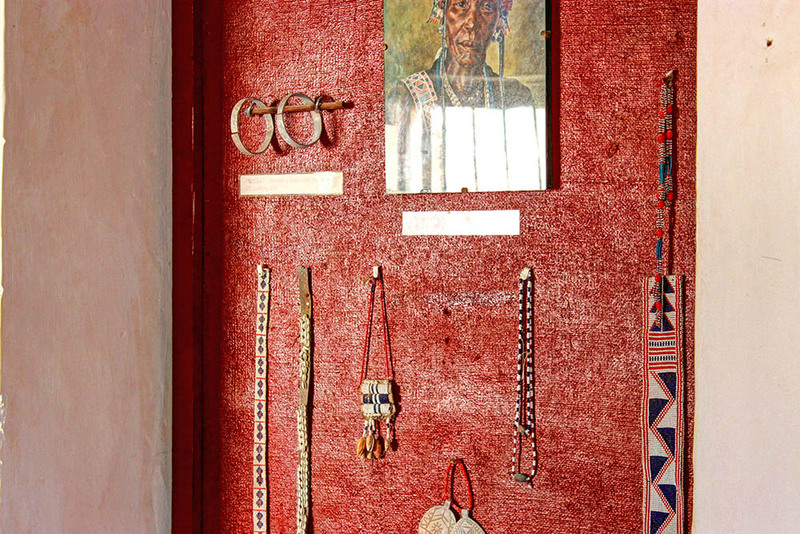 A set of steps leads up to the second floor which contains a myriad of displays including items from the peoples of the coastal province of Kenya. 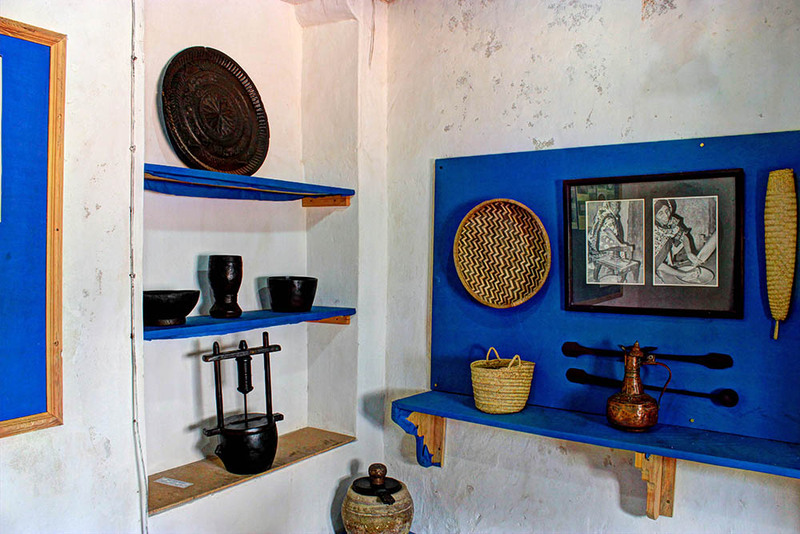 The other displays on this floor include typical Swahili bedroom and kitchen. 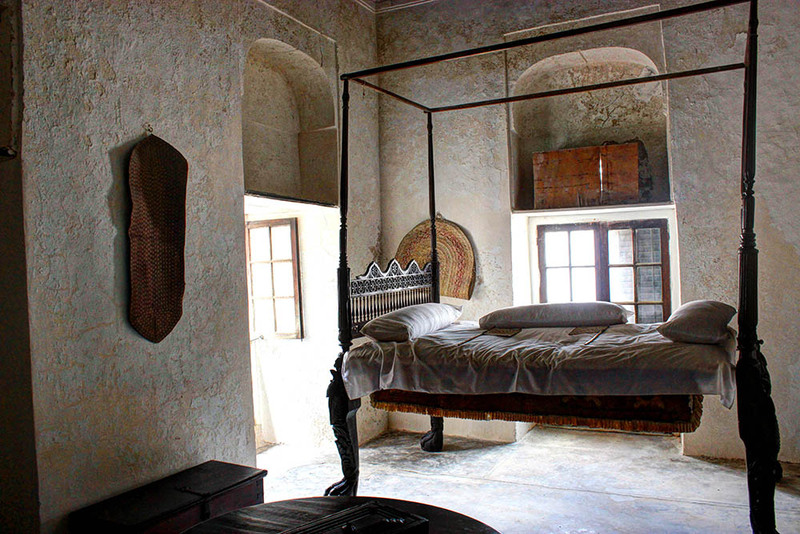 The bed in the room is a massive claw footed bed that someone as short as me would need a step ladder to get on. 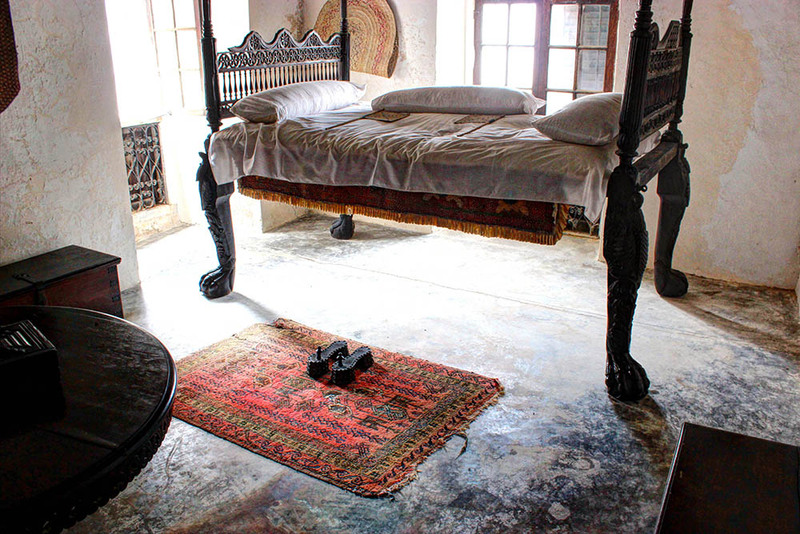 At the foot of the bed is another pair of slippers. I could resist trying them on and they were as uncomfortable as they look. 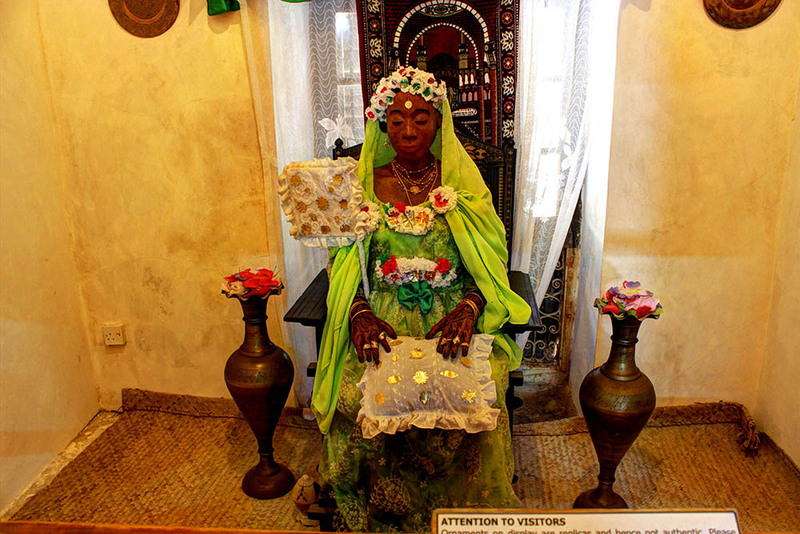 There is also a display of a bride in the traditional garb and the man of the house, ready to partake in an array of delicacies. 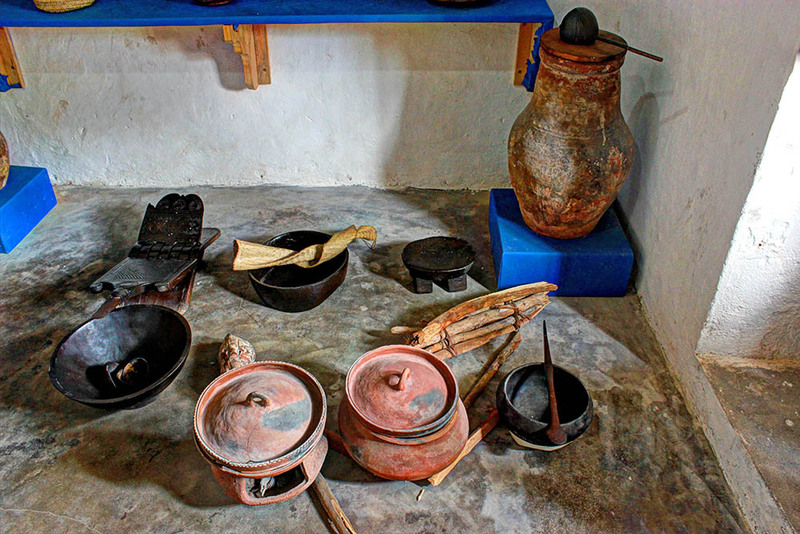 The kitchen contains various items that would be found in a typical Swahili kitchen. 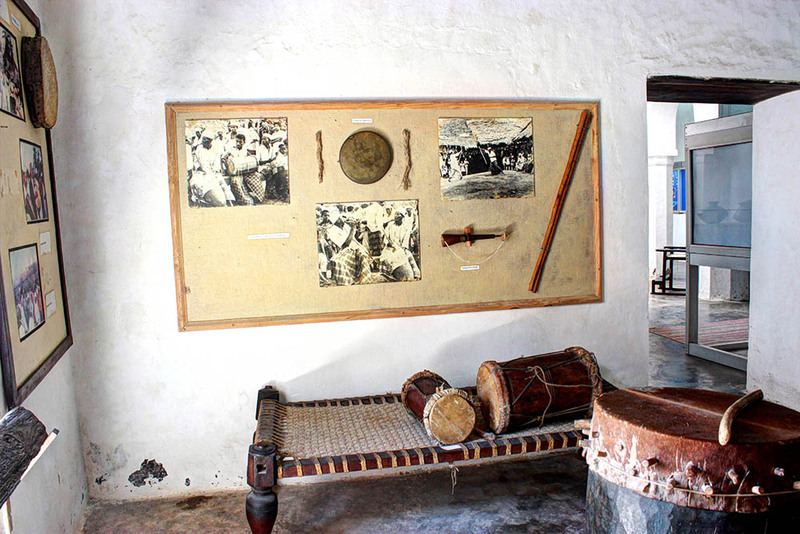 To the far right there is a Mbuzi, a Coconut shredder. 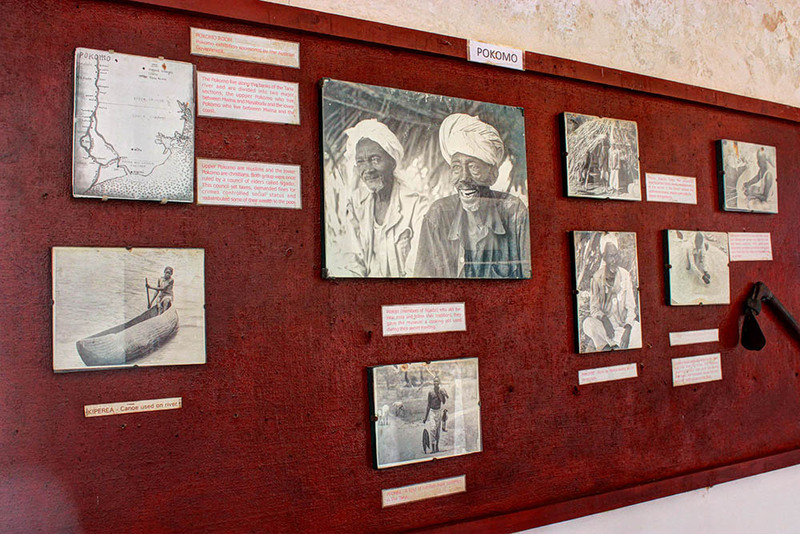 Coconut is a common addition to Swahili food. To the right of the shredder is a Kifumbu which is a strainer made of palm fronds used for squeezing coconut milk out of shredded coconut. 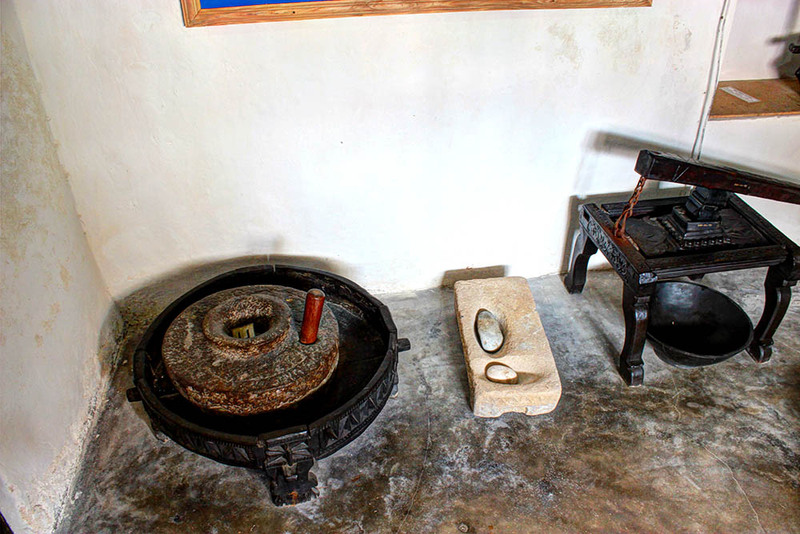 From left to right Jiwe la kusaga mahindi– stone for grinding maize, Jiwe la kusaga dawa– stone for grinding medicine and Kinu cha tambi: Wooden machine used for making spaghetti. 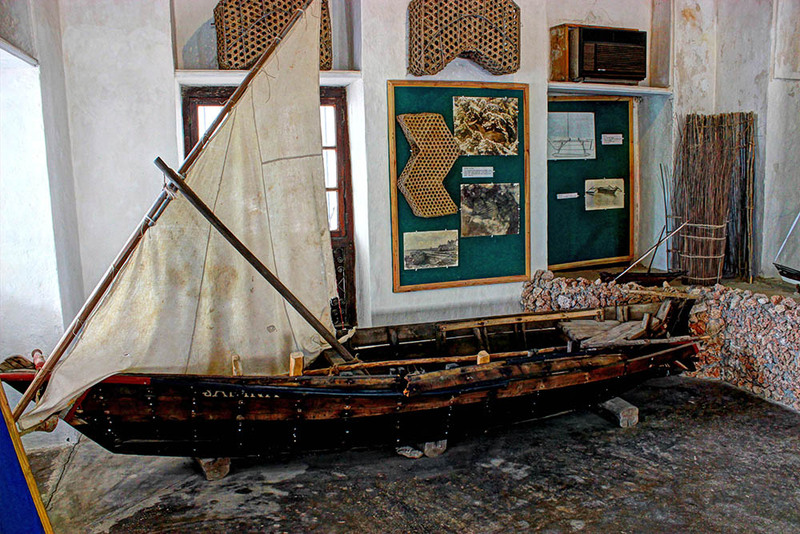 There is no missing the 2 model boats on display right in front of the doors leading to the balcony. 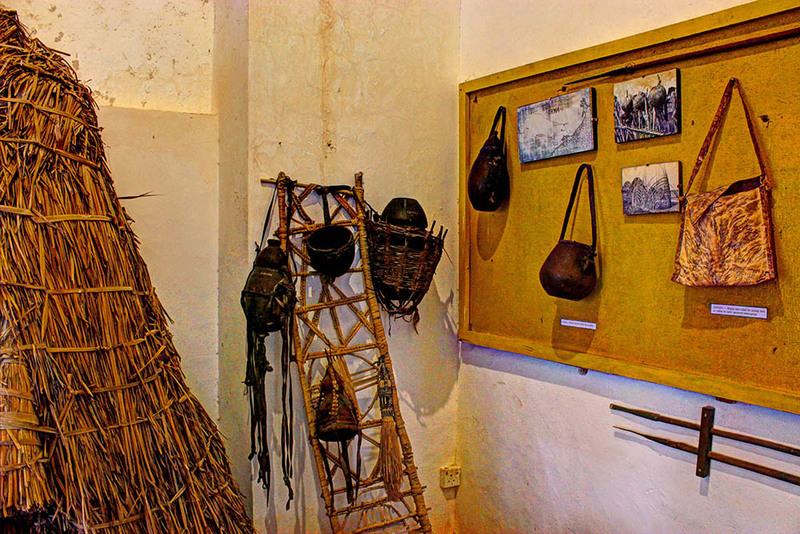 The one with a square sail is a Mtepe. 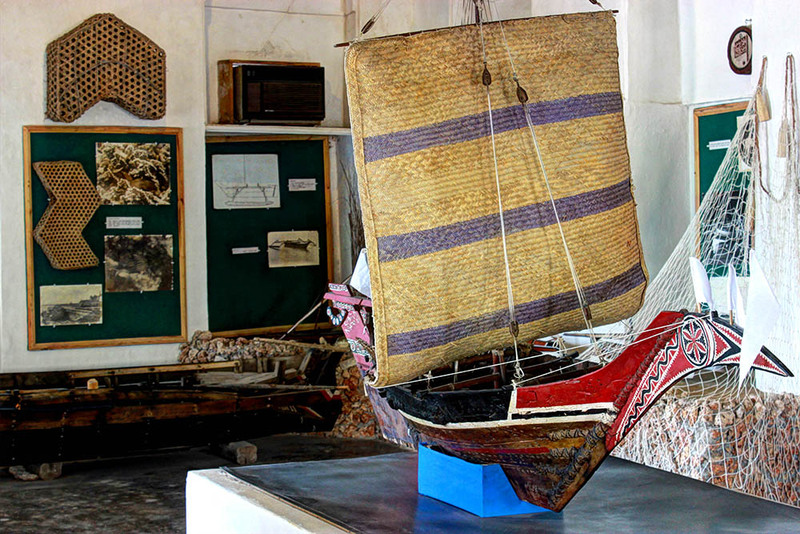 Unique to the Swahili culture of east Africa, Mtepes were built in the Lamu archipelago .The mtepe’s planks are held together by wooden pegs and coir so it is a sewn boat designed to be flexible in contrast to the rigid vessels of western technique. Due to their construction Mtepes leaked copiously, so bailing was constant. 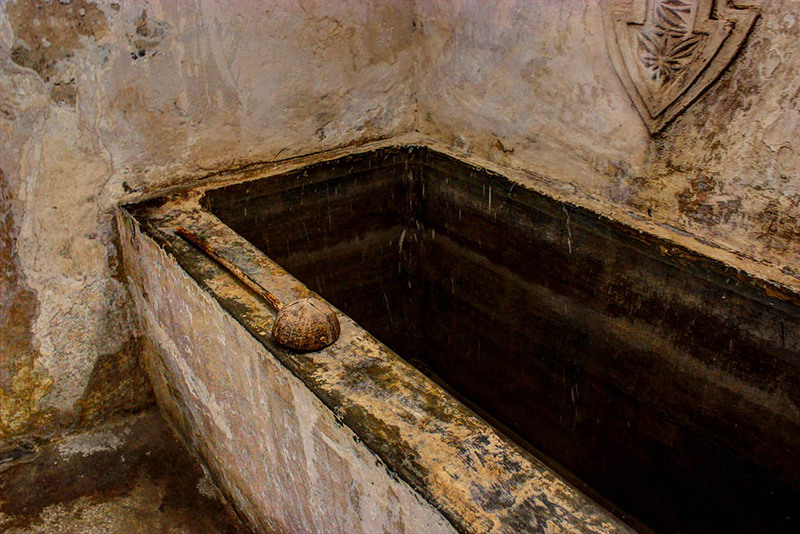 It is recorded that, as a test for employment, a prospective crew member had to demonstrate his ability to lift a bailer full of water measuring 24″ in diameter and 9″ deep. 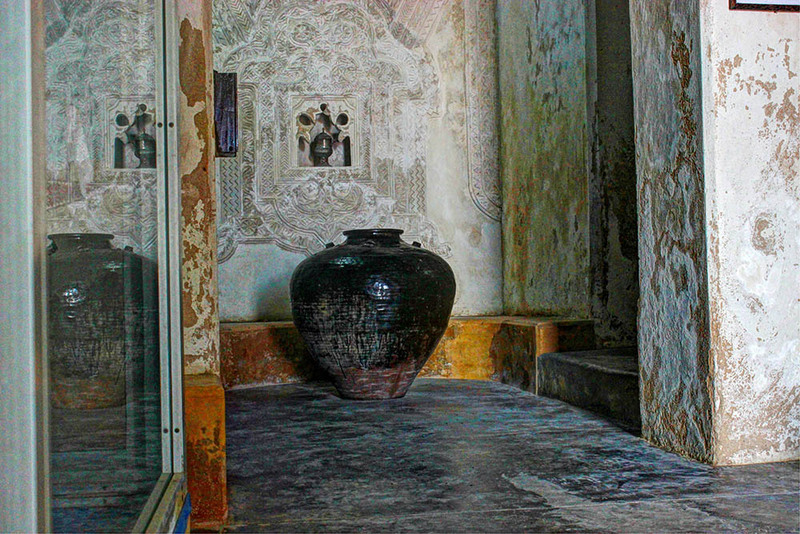 The museum’s balcony is the perfect place to end your tour. 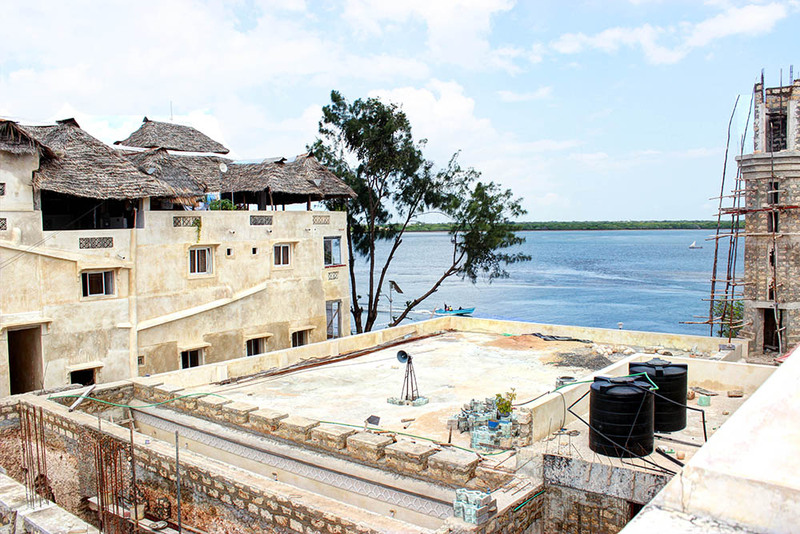 It offers great views of Lamu town and the seafront and there was also carved door that looked out of place but was beautiful nevertheless. 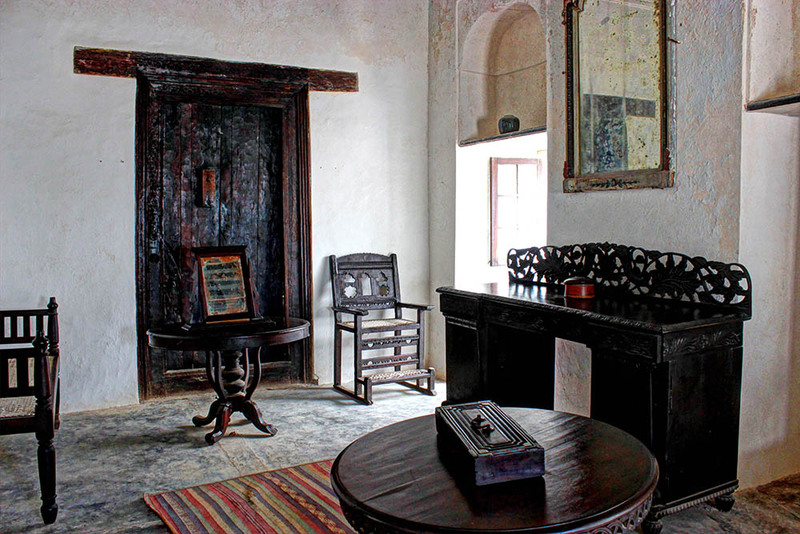 One ticket guarantees you entry into Lamu museum, the German post office museum and the Swahili House museum. 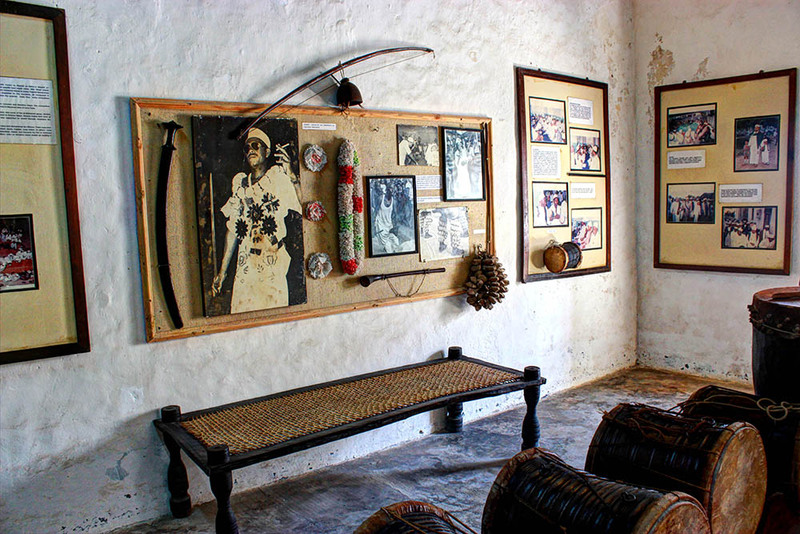 You do not really need a guide to enjoy your tour of the museum but it would enrich your experience if you get a knowledgeable one. Make sure you ask for permission before taking any photos, I did so but midway through exploring a man came up to me and asked if I had been authorized to take photos. Just stunning, what more can I say. You have a beautiful eye. 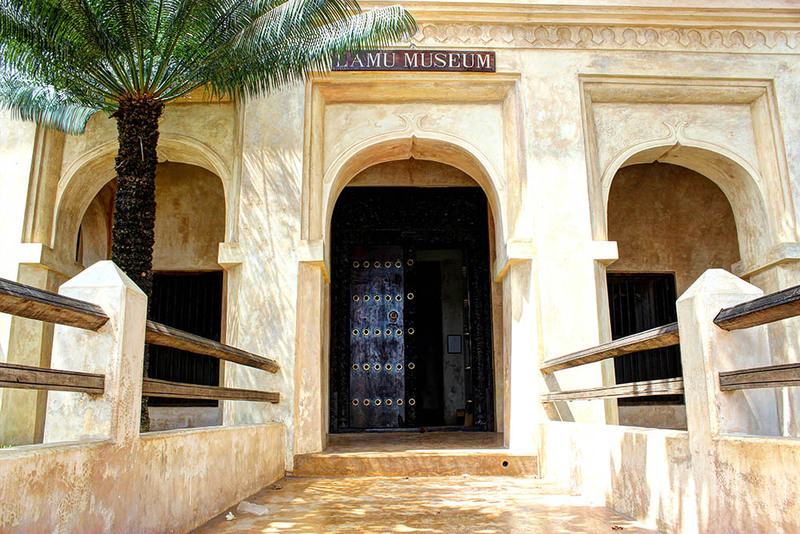 I had no idea there was a museum on Lamu. 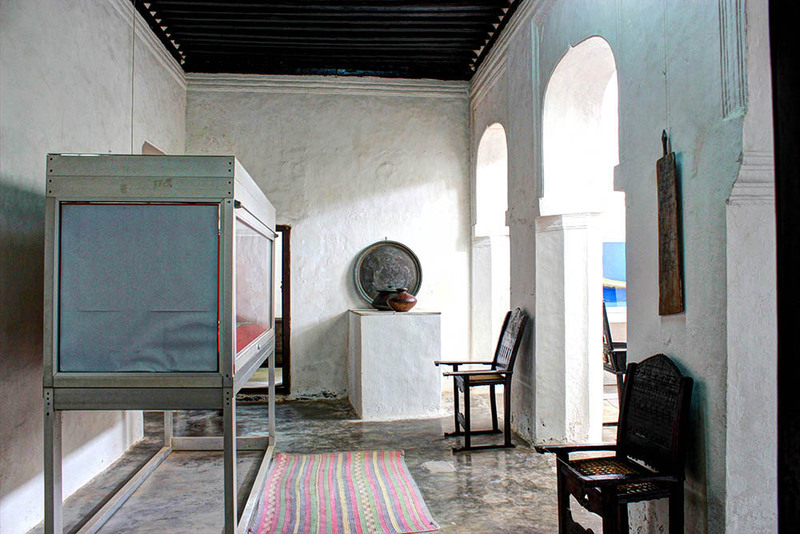 My Dad visited Lamu a couple of years ago and I have seen all his videos but heard no mention of the museum. 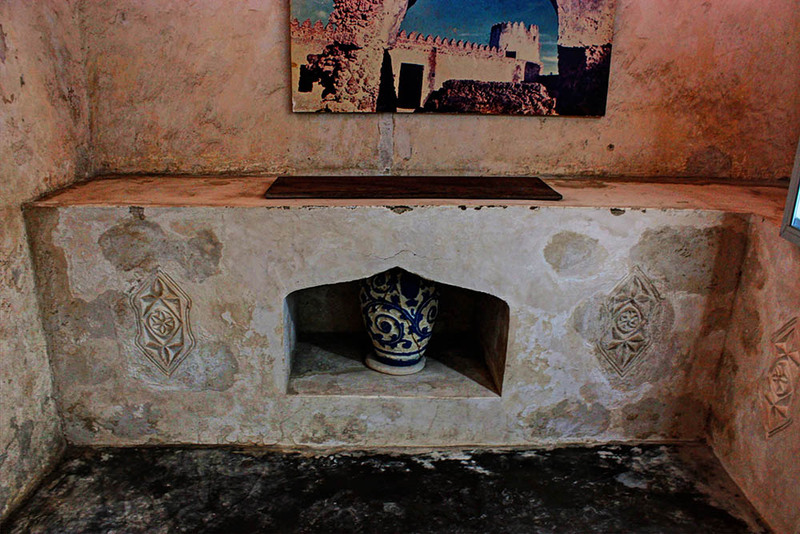 Beautiful photos, Rachael! 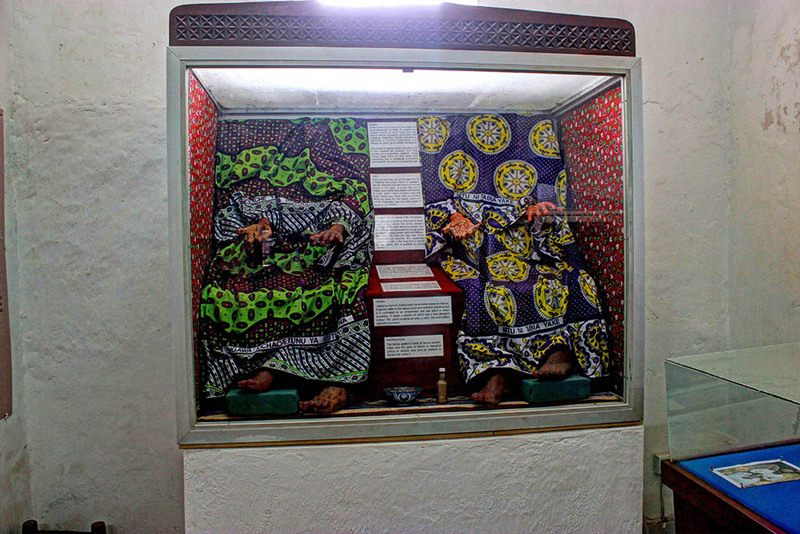 The building itself looks like it is worth a visit, but the pieces on display are incredible. 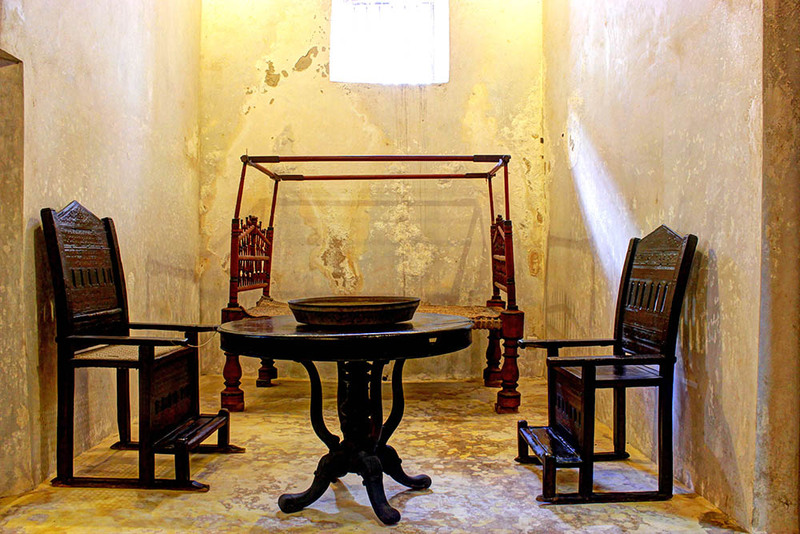 Wow – what a magical place and gorgeous pictures. 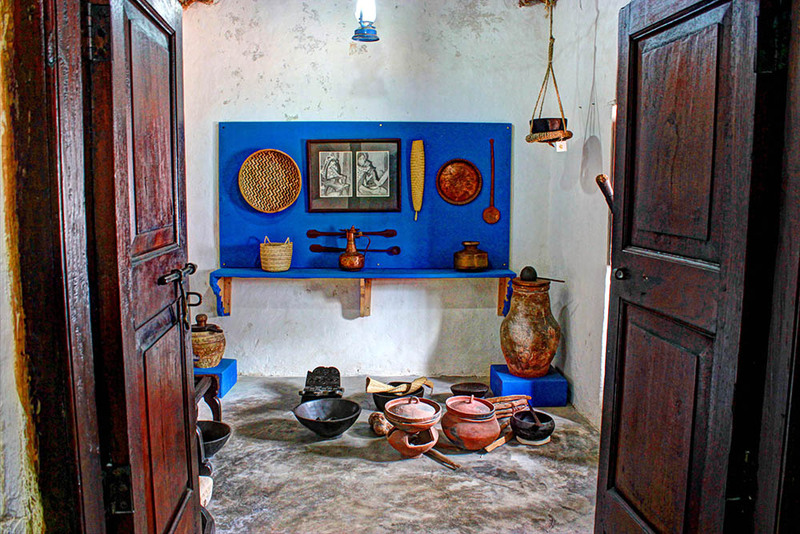 Neat museum, I like the lyre and the bathroom sandals 😉 Looks like there is a lot of see and a good value with all the things included. 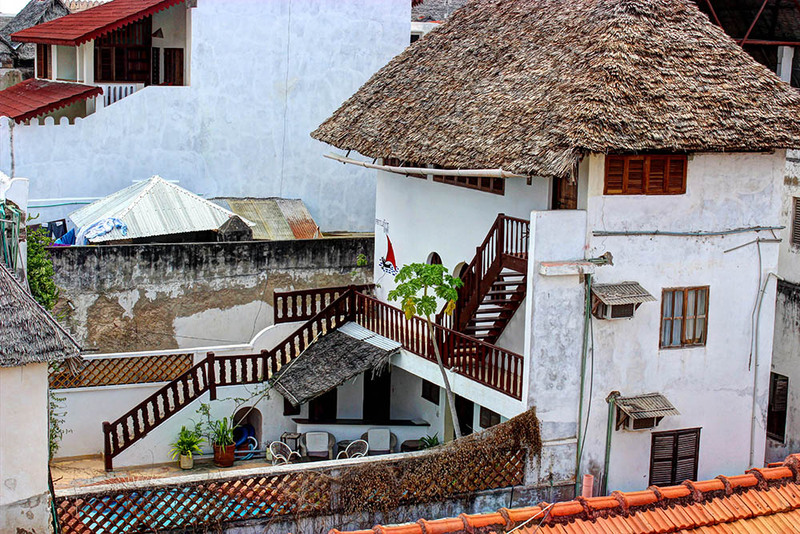 Lamu is magical I must say.